Designed For Life: I'm white, working class...does Yasmin Alibhai-Brown loathe me? I'm white, working class...does Yasmin Alibhai-Brown loathe me? The entirely understandable, and indeed correct, anger over Michael Fabricant's "I-would-end-up-punching-her-in-the-throat" tweet has overshadowed something equally as important, and to me, offensive: the actual debate itself between Rod Liddle and Yasmin Alibhai-Brown on Channel 4 News which provoked the stupid comment. Before I get into this, let me say I am no fan of Rod Liddle. I find him to be at best clumsy with his language, and at worst downright nasty and offensive. Last week, when the free copy of The Sun dropped through my letter box, I read his column about how great it was to be British. But for some reason it started with a perverse attack on Belgium and how terrible it would be to be born there. It's all very well going for the ha-ha-isn't-England-great-everywhere-else-is-rubbish line but for me it was in poor taste, unnecessary, and offensive. I don't think it's right or fair to dismiss a whole group of people with shared, often negative, characteristics. I don't think it's right or fair to tar a whole section of society with the traits of a minority within that group. Doesn't matter to me if that group is Belgian, Muslim, Christian, Black, White, Male, Female etc. 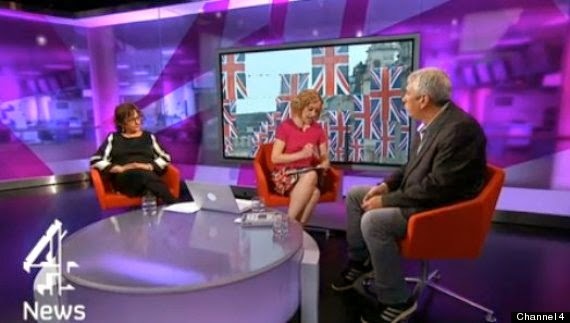 But last night Yasmin Alibhai-Brown did just night. She admitted she has "loathing" for the working class, based on negative and distressing experiences at the hands of some members of that section of society. Yasmin Alibhai-Brown:[Interrupts] "...And you. I'm clearly honest, I loathe you." It's not admitting to her loathing of Rod Liddle that offends me, it's the fact she didn't deny she has "loathing" for the working class. She hasn't met me. I come from a working class background. Does she loathe me? Have I threatened her? Have I assaulted her? Have I carried out any of the terrible things that have happened to her? Were there done in my name, or with my blessing or knowledge? Where is the indignation about that comment, to go alongside the anger at Michael Fabricant? No, she probably doesn't loathe you. For my own part, I'm none too fond of people whose life revolves around taking offence on their own behalf or vicariously on behalf of some victim group. You're offended by Fabricant, Liddle and Alibhai-Brown all in this one poor little piece which is to bestow your opprobrium a little too generously and a little too widely. Alibhai-Brown left wing BBC puppet, Muppet, loathsome hater of white working class Britain, she will go far. I have never read any article ... and here I do mean I mean ANY article by Alibhai-Brown that has not almost had me throwing my phone or computer screen out the window. The woman is professionally insulting, obnoxious, a rabble rouser (admittedly only of the chattering guardianista class) par excellence and frankly why the whole multicultural experiment is a complete and utter failure. multiculti can never progress past government enforcement while this harridan abuses all and sundry for minor or imagined slights ... and after crying wolf so often for so minor issues, where there is real issue you are SO SICK of the woman that you frankly take the other side simply to pee her off. She will come to loathe you if you do too much that is off-message as Mr Liddle has done. Keep mouthing the prescribed views though and at worst she'll merely talk down to you in a maddening way. I think Fabricant should have been a bit more tight-lipped. If it would offend Yasmin alibaba... I'd consider becoming racist!
" I'd consider becoming racist! Would be hard with a Turkish partner though ;)"
I was married to a Turkish girl, trust me it wouldn't be hard. Your second para isn't even a sentence. At that stage I gave up. Daily Express journ. Need I say more? Formatting error - good spot. Now amended. She is a clown and so are you. Why we do we afford you the oxygen of publicity? I will never forget the tear that rolled down Yasmin Alibhai-Brown’s cheek as she recalled the death of her favourite actor, Sid James, or how her sorrow quickly turned to girlish laughter as she recounted the actors in her favourite film, ‘Carry On In A Burqa‘. Charles Hawtrey as Khomeini, Bernard Bresslaw as Saddam, Hattie Jacques as Maddam and Matt Lucas hilarious as Kim Jung Un. And the reason for this silly inversion of language is?